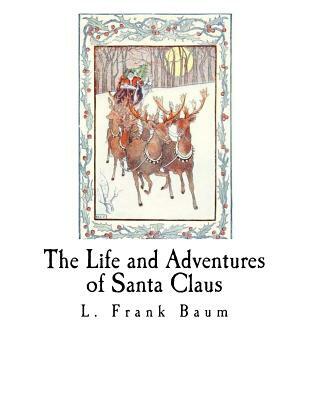 The Life and Adventures of Santa Claus by L. Frank Baum Santa Claus, as a baby, is found in the Forest of Burzee by Ak, the Master Woodsman of the World (a supreme immortal), and placed in the care of the lioness Shiegra; but thereupon adopted by the Wood Nymph, Necile. Upon reaching young adulthood, Claus is introduced by Ak to human society, wherein he sees war, brutality, poverty, child neglect, and child abuse. Because he cannot reside in Burzee as an adult, he settles in the nearby Laughing Valley of Hohaho, where the immortals regularly assist him, and Necile gives him a little cat named Blinky. In the Laughing Valley, Claus becomes known for kindness toward children. On one occasion, his neighbors' son Weekum visits him; and Claus having made an image of Blinky to pass the time, presents him with the finished carving, calling it a "toy." Soon, the immortals begin assisting him in the production of other carvings: the Ryls coloring the toys with their infinite paint pots (the first toy was not colored). When he makes a clay figure reminiscent of Necile, he proclaims it a "dolly" to evade naming Necile to the children ("doll" results when children shorten the name). Claus presents the first one to Bessie Blithesome, a local noblewoman, after consulting with Necile and the Queen of the Fairies about whether he should give toys to wealthy children. Later dolls resemble Bessie herself; and later still, counterfeit infant girls.